Bioenergy is stored sunlight from biological renewable sources. It contrasts with fossil fuels such as coal and oil, which are net adding CO2 to the atmosphere, and thereby contributing to the greenhouse effect. Until now, biopower has only been a possibility for large district heating networks, inevitably suffering from low usage of the primary energy in the feedstock due to the distance between fuel, power plant and consumer. With Meva Energy an industry operation that today at its best is selling its biomass residue to the highest bidder or more often simply has to dispose it without any pay at all instead can make use of it itself. By having a Meva Energy gasification plant at the industry site itself it is possible to use the own residue stream to produce gas or CHP to supply the industrial operations with self-made energy (and possible sell any surplus to the grid). No heavy and expensive transports of residue to a distant disposer or buyer. No distribution losses to a distant consumer. Only true circular energy systems. 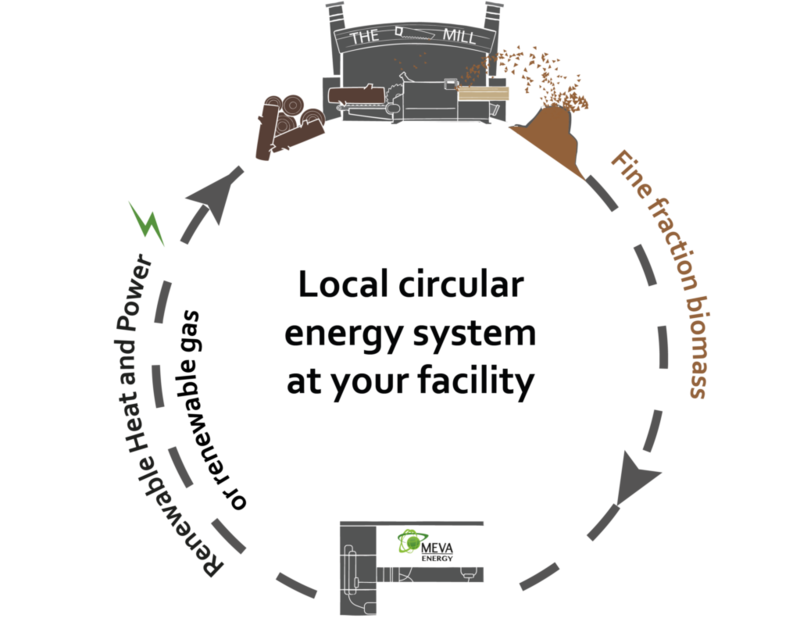 Biomass gasification is an emerging technology – only a limited number of installations have been made so far. However, the market potential is huge with an estimated European market value of more than EUR 20 billion annually.